The Federal Reserve’s October 2010 Senior Loan Officer Opinion Survey on Bank Lending Practices reports continued tight lending conditions by banks to businesses and households. The survey is based on responses from 57 domestic banks and 22 U.S. branches of foreign banks. Despite reporting that some large banks have eased lending terms over the past three months, a special question in the October survey found that lending conditions would remain tight for the foreseeable future. In particular, the majority of respondents involved with residential and commercial real estate lending indicated they would not return to long-term norms of lending practices until after 2012. On the other hand, 40% of respondents indicated that lending for mortgages and credit cards would return to long-term norms by the end of 2012. With respect to residential real estate lending, the Fed reported that small fractions of banks reported tightened standards on prime and nontraditional mortgage loans. Interestingly, the tightening was mostly reported by smaller banks, with larger banks leaving standards about unchanged. 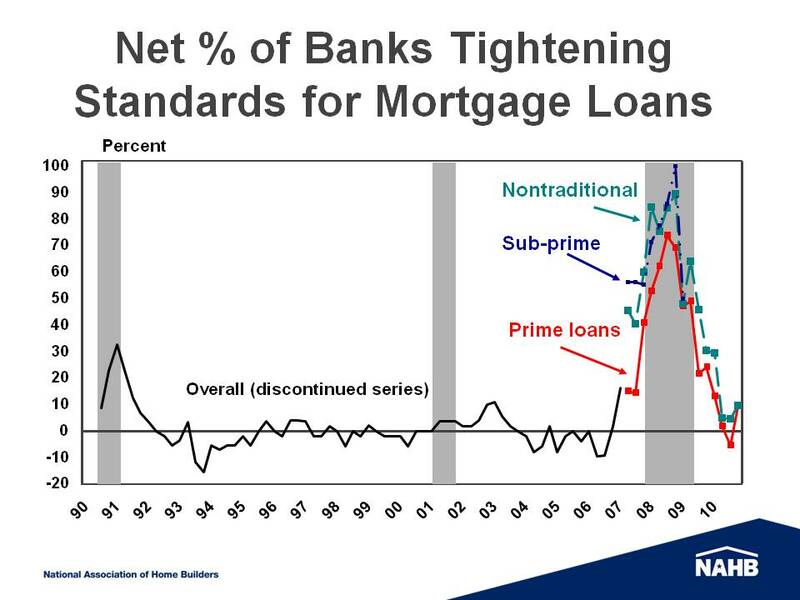 However, both small and large banks reported tightening standards for non-traditional mortgage loans. All banks reported small declines in demand for loans, likely related to the end of the homebuyer tax credit. The headline result of some easing of lending standards by big banks stands in contrast to recent NAHB survey data, which indicates continued tightening of lending to home builders.